Morgan Fess | Ioppolo Law Group, PLLC. Morgan is our Government Affairs Administrator. Morgan focuses her time ensuring our day-to-day representation of our Government Affairs clients runs smoothly and stays organized. Accordingly, Morgan assists in the creation of weekly and biweekly status reports for each client and maintains communication with clients and elected officials to ensure our clients’ immediate needs are met. Further, since joining ILG, Morgan played an integral role in the creation of our first annual ILG Blue Book. Before joining ILG, Morgan worked for a lobbying firm based in Central Florida and assisted in fundraising efforts for various state and local campaigns. Morgan has also had the benefit of growing up around politics as her father was Mayor of Lake Mary, Florida and her mother is a successful lobbyist in Tallahassee. 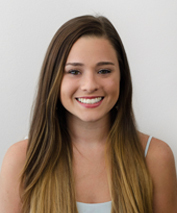 Morgan is currently a junior at the University of Central Florida majoring in both Business and English.